MAKERERE – Members of Parliament representing workers have said they are preparing to meet the suspended staff of Makerere University. 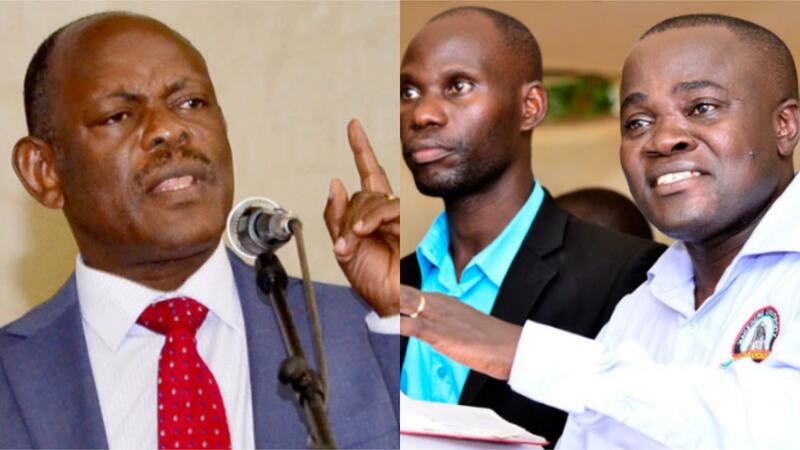 The MPs on Monday condemned the suspension of the three Makerere University Association members saying it is irregular and illegal. On January 17, 2019, Makerere University Vice Chancellor, Prof. Barnabas Nawangwe suspended Dr. Deus Kamunyu Muhwezi, the Chairperson Makerere University Academic Staff Association- MUASA for alleged indiscipline and inciting staff. The others suspended earlier include; Bennet Magara, the Chairperson Makerere Administrative Staff Association and his General Secretary, Joseph Kalema for alleged indiscipline and inciting staff. The suspension of the trio followed disagreements between staff associations and the university administration over pending issues including salary enhancement. Members of Parliament representing workers have said they will petition the speaker over the suspension of the Makerere workers, but also meet with the MPs to lay strategises on how to challenge the irregularities at Makerere University. Sam Lyomoki, the National Workers Representative says the suspension of the Makerere University staff will not stand since it is illegal. He says as MPs representing workers, they will use the legal means and also petition parliament on the matter. He says they are arranging to meet with the three suspended officers who represent their association interests, and ensure that the suspension is lifted and the Vice chancellor be blocked from sacking association leaders who actually represent workers. Lyomoki says the workers were suspended not because of their poor performance in terms of service delivery, but they were suspended for standing for the rights of workers in terms of salary enhancement, issues of irregularities at the University among others. Margaret Rwabushaija also a Workers MP says the Vice chancellor of Makerere University has disrespected the Union of workers in Makerere by suspending their leaders. She also says the Public service standing order on discipline was not followed well by the University administration. According to Rwabushaija, it is modern day slavery to expect intellectuals not to talk and challenge unfair policies. She says an MPs meeting with the suspended officials will see a final solution to the rampant suspension and bickering at Makerere University. The joint Makerere University Staff Associations has called for a university wide staff strike demanding the reinstatement of their leaders. They demand an end to attacks on University associations and its staff members by the vice chancellor, and also that Dr. Thomas Tayebwa and Bruce Balaba Kabaasa be removed from the University council, saying their stay is irregular.